I’m so excited to introduce The MIND Diet book by Maggie Moon, MS, RDN. Her book is a scientific approach to enhancing brain function and helping prevent Alzheimer’s and dementia through food. She has a ton of recipes in the book (including one from me) that will boost memory and improve heart health. 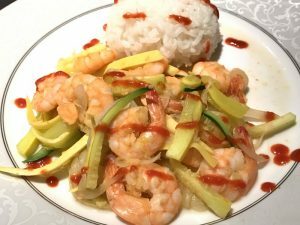 I tested out a delicious recipe: Sriracha Shrimp with Zoodles from the MIND Diet Book. This is now going to be one of our quick, go-to recipes. 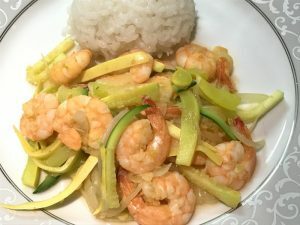 It has protein from the shrimp, spice from the sriracha, and delicious zucchini and summer squash to make the zoodles. Zoodles are “noodles” made from vegetables. You can use a spiralizer to cut the vegetables into a noodle-like shape. I don’t have a spiralizer, so I just used a knife and cut it really thin. Check out the recipe below. 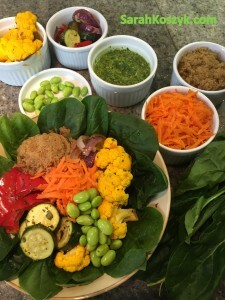 Maggie included my recipe, Edamame, Amaranth, and Chimichurri Nourish Bowl, in her book, too. The Nourish Bowl is a bundle of love and nutrition in one, well-balanced dish. You must check out her book, The MIND Diet. Your taste buds and brain will benefit from all the fabulous dishes and memory-optimizing meals. Enjoy this recipe from the MIND Diet Book by Maggie Moon, MS, RDN. 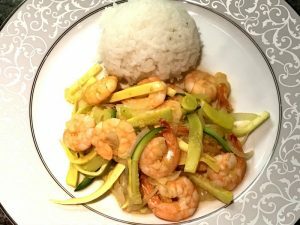 Slice zucchini and squash in a spiralizer to make the noodles. 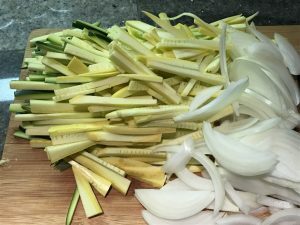 If you don’t own one, use a knife or mandolin to create the julienne-shape. Cut spiraled vegetable noodles into 4 to 6-inch pieces. In a large skillet or wok, heat olive oil over medium heat. Add onion, garlic, and ginger to oil and cook for about 3 minutes until onion softens. Add in shrimp, and cook until pink and opaque, about 5 minutes. 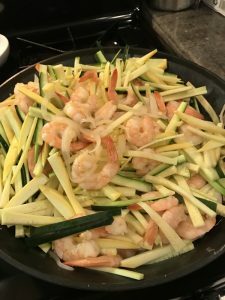 Add in spiralized zucchini and squash to skillet, and cook for about 3 minutes to soften. Add in sriracha sauce and stir to coat.